WASHINGTON (Bloomberg) -- Daimler AG's Mercedes-Benz E-class cars are under investigation by U.S. regulators because air bags in the vehicles may not deploy properly in crashes, the National Highway Traffic Safety Administration said. About 100,000 cars from the 2005 and 2006 model years may be affected, NHTSA said in a Web site posting late Tuesday. The auto safety agency said it received four complaints about failures in the module-wiring harness of the steering column, which can result in air bags failing to inflate in frontal crashes. No injuries have been reported. Robert Moran, a spokesman at the U.S. unit of Mercedes in Montvale, New Jersey, had no immediate comment. 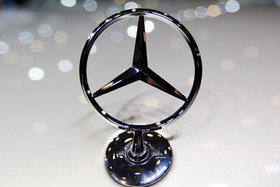 Daimler, based in Stuttgart, is the world's second-largest maker of luxury cars after Munich-based BMW AG. The U.S. Congress has focused more on auto safety this year following Toyota Motor Corp.'s record recalls for defects that may cause unintended acceleration. NHTSA Administrator David Strickland is scheduled to testify tomorrow at a Senate Commerce Committee hearing on legislation to increase regulation.